CPQ Perspectives is a series of blogs designed to look at Configure Price Quote systems through the eyes of those who encounter them. We spend so much time talking about CPQ as it relates to sales that we lose sight of the fact that CPQ extends well beyond those processes. Our second piece in this series will look at distributors—those businesses that are primarily concerned with delivering products into specific markets. Distributors represent an essential link in the value chain between the manufacturer and the end-user of products. They are not so much concerned with manufacturing processes or upstream supply chain issues other than how those issues might affect their ability to serve their customers. Their focus is on customer service and operational execution. Customers have expectations relating to customer experience, product availability and services tailored to their individual needs. Distributors must clearly understand and address these expectations and at the same time, run a profitable operation. Those business realities are manifested in inventory and logistical efficiencies, order accuracy and cost controls. The customer service aspect of growing and running a profitable distributorship is both an opportunity and a challenge. Customers demand a buying experience that features sophisticated specification, configuration and visualisation of the complex, highly personalised products they are seeking. Distributors are indeed feeling pressure from manufacturers that may offer this from their own online commerce facilities. Coupling this with rapid-shipping or drop-shipping capabilities from the manufacturer threatens the whole relevance of the distributor within the context of serving prospects and customers. How Do Distributors Maintain Relevance? In a recent piece from the National Association of Wholesaler Distributors, the author makes a compelling case for distributors to move away from an inward-looking success strategy based on operational efficiency. Distributors need to move toward models that are more focused on external factors such as customer satisfaction and ultimately into a market-driven model driven by data and the informed decision-making that comes through the careful analysis of that data. Global management consultant, Allen Austin, is more specific in his recommendations for success in the distribution space. Invest in technology that facilitates operational efficiency and market awareness. Think and act competitively, and differentiate your products and services with compelling and sustainable advantages. Balance cost controls with improved customer service and satisfaction. In other words, being a distributor does not make you immune from the realities of running a business, and it requires distributors to embrace technology to foster adaptability in any highly dynamic market space. Bringing a CPQ solution in-house will provide several advantages for distributors almost immediately. Coupling CPQ with other technologies, such as an ecommerce portal and CRM, will turn the distributor into a powerful marketing and selling machine—a business that not only services the end-user with a greatly improved buying experience, but also a business that increases the value of the distributor to the manufacturer. How Does CPQ Pull This Off? Let’s take a look at four areas that offer easy opportunities for improvement. Do you maintain a boiler-room operation that provides customer assistance through phone and computer-tethered employees? These people are expensive, and they provide services that can be handled at a much lower cost via technology. These employees can be reallocated to more critical functions that drive and deliver greater value to your customer. Inquiries are answered via complete and detailed product information. Orders are entered via automation within the CPQ product that virtually eliminates configuration and pricing errors. CPQ contains technology that interacts with your prospect or customer to help them quickly align your highly configurable product to their specific needs. Additionally, that product is fully specified at the end of the interaction, which facilitates the automated entry of orders as described in the initial point above. BOMS are supplied, and accurate pricing is provided. This eliminates the vast majority of order-entry errors. The offline selling process typically involves the exchange of verbal information, written collateral and graphics that offer limited value and high potential for interpretive errors. CPQ replaces these inefficient processes with the interactive interviews that inform the product and option selection with customer-supplied information. Additionally, visualisation of the product, as it is configured, gives buyers the confidence that they are buying exactly what they need to buy. This visualisation can be delivered online and also within the proposal if desired. Prospects are able to quickly obtain accurate product information, and customers are quickly able to initiate the order process without one-on-one discussions with phone-bank personnel or expensive field sales reps. The inquiry is satisfied, the buy decision is made and the order is processed quickly and with confidence via CPQ and your e-commerce solution. By boosting their level of customer interaction and involvement in the buying process, distributors are assuring customers that they are being served by their supplier better than they would be by seeking a direct interaction with the manufacturer. The manufacturer selected an indirect selling model because it offers them access to their markets without having to maintain a sales force and the expense that goes along with it. Distributors offer focused access to specific markets, the expertise to understand and serve those markets and the ability to move product into those markets efficiently and profitably. 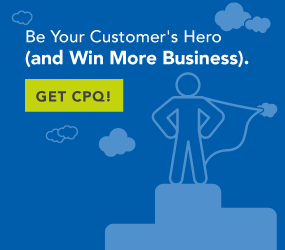 CPQ helps distributors deliver a customer- and market-driven buying experience. This assures the delivery of higher value and lower costs to the customer than the direct selling model can sustain over time.